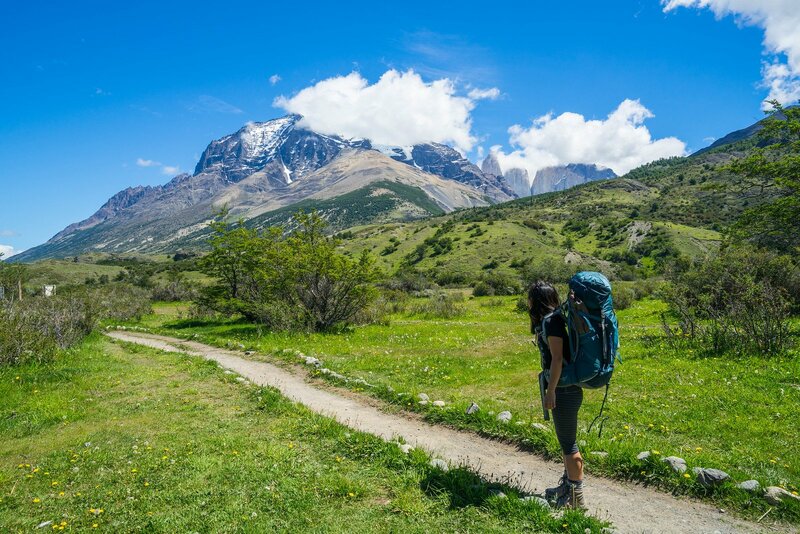 Trekking the W is the best way to see Torres del Paine National Park. Here's everything you need to know. Rugged mountain peaks. Stunning, blue alpine lakes. Jaw-dropping rock formations everywhere you look. 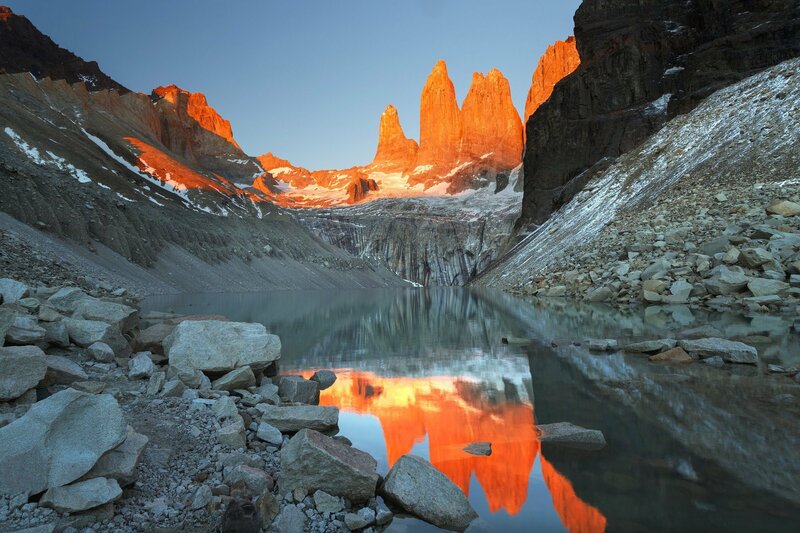 There’s a good reason why the Torres del Paine W Trek is one of the most famous hikes in the world. Torres del Paine is basically what happens when you cram all of the beautiful things on earth into 181,414 stunning hectares, and the W Trek is the best way to see it in a short amount of time. When I first did the W Trek without a guide in 2016, I basically fell head-over-heels in love with Torres del Paine and Patagonia in general. I’d never seen such incredible rock formations or stunning landscapes, and the entire experience was extremely humbling and rewarding. For most of the time, I hiked solo or with people I met along the way (many of whom I am still friends with today!). The challenge of carrying everything I needed in my backpack and exploring the park on foot got me hooked on hiking. While I definitely made some silly mistakes, like forgetting to bring silverware and packing an oversized tripod, I learned so much from my trekking experience on the W that I’ll never forget. Let’s just say that the W Trek miiiiiight have turned me into an adventure addict. Trekking the W was such a deeply enriching experience for me that I decided to come back again in 2019 to hike Torres del Paine again, this time with my boyfriend. And, although the weather wasn’t ideal, we loved every second of our trek in Torres del Paine. I learned after my two trips to Torres del Paine that there’s a lot of misinformation (or a straight up lack of information) out there on the W Trek, so I decided to create this complete guide to help you plan the most incredible hiking experience possible! Glacier Grey is one of the iconic sights on the Torres del Paine W trek. While I do think that most people who are in reasonable shape can complete the W Trek, it isn’t just a walk in the park. You’ll need to come prepared for several days of hiking 8-15 miles, often uphill or on gravel surfaces, and you’ll need to have proper gear with you. But I really do think that the W Trek is accessible to people who are willing to prepare properly for it. If I could do it as a solo, first-time multi-day hiker, you can definitely do it too! When Can I Trek the W? Typically, the main season for trekking the W is late October through March. During this time, all of the campsites, refugios, and ranger stations will be open, and you can hike on your own without a guide. In the high season, the weather is super variable and can range from sunshine and light breeze to thunderstorms, sleet, and high winds. I have experienced all of the above in my 2 trips to Torres del Paine, and a lot of it has to do with luck. This could be completely anecdotal, but we talked to a local who used to work in Torres del Paine and she said that the mildest weather occurs in November and in late February to early March. Use that information however you’d like. For cold weather-loving hikers, the W Trek’s trails are actually open all year. However, you can only hike in the winter with a guide, so it will be considerably more expensive. Can I Do the W Trek Without a Tour Guide? Absolutely, yes! A lot of people think that you need to go with a tour or a certified guide to be able to do the W Trek. This is not true — you can trek the W with a tour guide, but you certainly aren’t required to. The trails in Torres del Paine are super well-marked and easy to follow, and there are a decent number of hikers around to link up with or ask directions from. Both times I did the W trek, I did it on my own, carrying my own stuff and guiding myself. I had no problems whatsoever (other than over-packing, tripping over myself and forgetting to bring silverware) and would recommend DIY-ing the W Trek as a completely safe option for anyone who is reasonably fit and up for the challenge. How Can I Prepare Fitness-Wise for the Trek? I’m no fitness expert, so I can’t comment with any certainty or authority here. However, I will say that many of the people I met on the trail had never done a multi-day hike before, and there were people of all ages, body types, and fitness levels on the trails. Personally, the W Trek was my first fully-packed multi-day trek, and that it was challenging but not impossible. The hardest part of the whole thing was the mental stamina required to hike 7+ miles a day for 5 days straight. How Much Does Trekking in Torres del Paine Cost? If you plan far, far in advance, this adventure in Torres del Paine doesn’t need to cost too much money at all. Flights and hotel/hostel stays in Puerto Natales will likely be the most expensive parts of your trip. If you need to rent gear or want to stay or eat in refugios, the costs will be significantly higher. Most refugios cost over $100 per person per night, plus the cost of food. You could do it for even cheaper than we did by choosing a different campsite than Chileno (perhaps Torres Central, which is just $20 per night), and by buying cheaper food (we had mostly expensive backpacker meals from REI and some snacks from Puerto Natales). Torres del Paine national park has tons of scenic viewpoints all along the W trek. Before you can book your campsites, you’ll need to choose your W trek route. You can take one of two directions on the W Trek, and itineraries range from 3 days to 5+ days. Depending on how much time you have and how much walking you want to do each day, you can plan your route that way. At the end of this post, I’ve included three sample itineraries you can follow to plan out your route. You can also download our free PDF guide to Torres del Paine to see all of the itineraries and routes in one place. If you’re doing the W Trek, you’ll need a place to stay each night of your trek. Luckily, there are various options based on your budget and comfort preferences. In general, there are two ways to stay in Torres del Paine: camping or refugios. Camping involves either bringing your own gear or renting it at the campsites, sleeping in a tent, cooking in the kitchen areas, etc. It’s pretty similar to any other camping experience, except you’ll have hot showers, a convenience store, and running water in most campsites. You can read our entire, detailed guide on camping in Torres del Paine here. Refugios are the more bougie accommodation options on the W (although I wouldn’t call them “luxury,” per se…). These usually consist of large cabins that have dorm rooms accommodating 4-6 people. Usually, the basic package only includes a bed, and you’ll have to provide your own linens/sleeping bag. For an extra fee, you can purchase a full meal service in the refugio restaurant and have your bed made with sheets during your stay. Only certain campsites have refugios — see below for details. While trekking in Torres del Paine, I’ve chosen to camp both times because I love how it feels to wake up to fresh, crisp mountain air. I appreciate that the campsites had hot showers and indoor places to sit, and that was usually enough for me because I ALWAYS want to be outside! However, I have stayed in a few of the refugios as a break from camping (setting up and breaking down the tent and campsite gets tiring after a while!) and I definitely understand the allure. Honestly, booking campsites in Torres del Paine is a bit of a frustrating process and requires some patience. The campsite reservation websites break often, some of them are not translated into English, and with three different operators to choose from, it can get extremely confusing. However, just remember that booking your accommodations is one tiny obstacle in the way of a totally epic and amazing trip! You’ll need to make your way to the Patagonian city of Puerto Natales before heading onward to Torres del Paine for your trek. Puerto Natales is known as the “base city” for Torres del Paine, and is the place where you’ll run your last errands before embarking on your W trek. To start, you’ll fly to Punta Arenas on either SKY Airlines, LATAM, or JetSmart. For the lowest fares, I recommend booking your flight at least 1 month in advance. You can compare flight prices on Skyscanner or a similar flight aggregation service. There are several direct flights per day, but I strongly recommend flying in the morning so you can travel directly to Puerto Natales (3 hours by bus) when you land. Next, you’ll catch a bus from the airport to Puerto Natales. While buses leave from both the Punta Arenas bus station as well, you’ll save yourself a taxi ride by booking a direct bus from the airport. Buses leave almost every hour and are operated by Buses Fernandez and Bus Sur. In my trips, I have used and recommend both bus companies. You can book your bus to Puerto Natales in advance here (which I strongly recommend during the high season). When you arrive at Punta Arenas airport, go directly outside to the passenger pickup area, then take a left towards the first entrance. This is where the buses pick up passengers. Once you’re in Puerto Natales, you’ll probably want to stay there a day or two so that you can prepare for your hike. From there, you can take a 7:00 AM bus any day of the week to Torres del Paine National Park. Getting to the start of the W Trek requires either one more shuttle ride or one more catamaran ride after you’ve arrived at the park. I’ll explain this a bit more in detail later in the post. Even with gloomy weather, the view at the end of the W trek in Torres del Paine is worth the effort. The first time I did the W trek in Torres del Paine, I feel like I packed pretty well. But I did forget one extremely important thing: silverware. Yup, as you can imagine, I ate with my hands or borrowed forks from fellow campers, and it SUCKED. While silverware may seem like an innocuous thing to forget, it’s a prime example of something that can cause you a lot of inconvenience and annoyance for the entirety of your trip. Cooking supplies: You’ll need a packable cooking pot, stove, gas cannister, and silverware (yep, don’t forget silverware!!) to cook your meals. Eco-friendly soap and a quick-dry scrubber: Be sure to get eco-friendly soap (I love CampSuds) and a stink-free scrubber so you can clean your dishes after every meal. Most of the campsites on the W trek have gorgeous views of the mountains. Fly from Santiago (SCL) to Punta Arenas (PUQ). Walk outside and take a left toward the first airport entrance. Take the direct bus you booked on Buses Fernandez or Bus Sur from Punta Arenas airport to Puerto Natales. When you arrive in Puerto Natales, walk (~10-15 minutes) or take a taxi (1,500-2,000 CLP) to your hotel or hostel. Book your bus tickets to and from the park: Before you leave the bus station upon arrival in Puerto Natales, you’ll need to purchase bus tickets to and from the park. I recommend buying a flexible round trip ticket with Bus Sur that you can use any time on the day of your departure. Purchase your CONAF park entrance online (optional): There’s a kiosk at the bus station where you can purchase your CONAF ticket so you won’t have to do it at the park entrance. While this won’t really save you any time there, it’s good to do this in advance for the peace of mind! Get cash: There are no ATMs in Torres del Paine, so I strongly recommend getting some cash for incidentals/emergencies in the park. Buy food & gear: Look over your packing list, and if there are additional things you need before trekking in Torres del Paine, be sure to get them in Puerto Natales. Personally, I recommend getting some dried fruit at Itahue Frutos Secos and hitting up the grocery store for some snacks. Wrap your clothes and sleeping gear in waterproof material: If there’s one thing you need to know and remember during your time in Torres del Paine, it’s that the weather can change in an instant. Like, one minute it’s sunny and blue skies, and the next minute the wind picks up and fat wads of cold rain are pelting your face. Because the weather is so unpredictable, be sure to wrap your clothing bags, sleeping bag, and sleeping mat in plastic or waterproof coverings to keep everything dry, even if your backpack gets soaked. Screenshot or print all campsite reservations: Be sure to screenshot and/or print all of your campsite reservations, as the check in staff will require proof of your reservation every night! Send important documents & itinerary to a trusted person at home: It’s always a good idea when traveling to give someone at home access to your documents (e.g., passport, PDI paper, travel insurance) as well as your itinerary, just in case you’re in trouble and need help from home. Also, make sure that your loved one also has a “code red” date; basically, they will agree to contact authorities if they haven’t heard from you by that date. Check email & update your social media: Not necessary but, as there’s limited WiFi in the park, it’s probably a good idea. Arriving in Torres del Paine National Park is…well…kind of a sh*t show. You’ll get in with no problems, but not without waiting in tons of lines, filing lots of paperwork, and struggling to make sure you’re on the right bus to the right place at the right time. But, don’t fret! We’ve laid the entire process out for you step-by-step in this section. Entering the park should be really straight forward because everyone has to do it, but unfortunately, entering Torres del Paine is a chaotic, disorganized mess. Hang in there, I promise that the park is worth the initial frustration! You’ll see the line as soon as you arrive — it stems out onto a balcony in front of a small building and usually wraps around a couple of times (depending on how early you get there). First, you’ll wait in the line, then, you’ll head into the room with the safety video. The video is only ~5 minutes long. Next, you’ll leave the video room and head into a second room with some cashiers, as well as some rangers that are giving away park maps. If you haven’t bought your ticket yet, this room is the place to do so, and as of March 2019, you could only pay in cash. The first glimpse of the W trek as you come across the catamaran is jaw-dropping. One of the nicest things about the W Trek in Torres del Paine (aside from, ya know, the most gorgeous landscapes in the world) is that you can customize your route to fit your schedule. In the sections below, I’ve detailed 3 of the most popular itineraries (with day to day trail details) for trekking the W. You can follow them exactly or use them as a base to plan your own itinerary for the W Trek! Additionally, I’m starting at Paine Grande and working counter-clockwise, but you can also do this itinerary backwards, starting at Torre Central and finishing at Paine Grande. Just flip the dates! You’ll start this day by arriving at the Puerto Natales bus station at 6:40 AM. Take the 7:00 AM bus from Puerto Natales to the Torres del Paine entrance, pay for your ticket, then catch your bus again to Pudeto. From Pudeto, go immediately to the line for the catamaran, which has limited space and leaves at 11:00 AM for Paine Grande. At Paine Grande, you can eat a quick lunch at the provided picnic tables. Then, you’ll begin your hike up ~11 kilometers to Grey. For most hikers, the hike to Grey takes 3.5-5 hours. The first time I did it, it took me closer to 5 hours. The hike to Grey begins with a trail through a large canyon area. Then after about an hour, you’ll reach the mirador of Laguna de los Patos (literally “The Ducks Lake,” isn’t that so cute?!). Pass by that lake on the left and walk for a bit longer, through some rocky terrain full of incredible boulders. About 2-2.5 hours in, you’ll reach the Glaciar Grey mirador. This is the halfway point! If it’s not too windy, I recommend stopping here for a break and a snack to admire the gorgeous glacier below. Next, continue on the same trail, where you’ll continue to see views of the glacier and the lake below. You’ll pass over a few small bridges, a couple of steep spots with running water (be careful of slipper rocks here! ), and finally, after ~2 more hours, you’ll reach Grey. First, you’ll see the refugio, where you’ll check in if you are staying indoors. If you’re camping, pass the refugio on your left and head to the camping check in, which is the next building over. You’ll set up camp in the Grey campsite across from the check in building, which has wonderful views of the surrounding mountains. Overnight at Grey campsite or refugio. This is a pretty easy day, so don’t leave in a rush to get back to Paine Grande. Actually, after you wake up, I recommend continuing up the trail towards Paso campsite. First, you can stop at the mirador of Grey Glacier near the campsite, which I highly recommend as it’s a really breathtakingly close view of the glacier and lake. Next, continue on the main trail towards Paso. You can’t walk all the way up to the camp, but you can go to the stunning hanging bridges, which are totally terrifying to cross but are beautiful and picturesque to look at. There are three bridges between Grey and Paso, and I would really only recommend going to the second one (there’s not much more to see between the second and the third, IMO…). Take 1-2 hours to explore the Grey area in the morning, and then before noon, head back down the same way you came towards Paine Grande. It should take you 3-4 hours to return back, as it’s mostly downhill. Once you arrive at Paine Grande, you’ll check in for camping in the back (the backside of the main building, near the tents). For the refugio, enter on the side nearest the catamaran entrance and check in at the front desk next to the cafeteria. Pro tip: At Paine Grande, beware of foxes, which like to play rough with each other in the fields and steal food from gullible campers. Overnight at Paine Grande campsite or refugio. On a clear day, you can see Paine Grande and the Cuernos from one of your first campsites on the W trek. You’ll really want to get an early start this day. Head out from Paine Grande early and, after ~2 hours of mostly flat terrain, you’ll reach the Italiano Ranger Station and campsite. Whether you’re staying here or not, you can drop off your big bag here for your hike in the Valle Frances; just make sure you don’t leave your valuables. The hike up to Mirador Britanico is one of the more difficult stretches in the park. At first, it’s not so bad, and after about 1.5 hours, you’ll reach the first mirador, Mirador Frances. Here, you can see really beautiful views of Paine Grande mountain, as well as the surrounding rock formations in the valley. However, the true gems are at Mirador Britanico. After you’re done drooling over the intense natural beauty at Mirador Britanico, head back the way you came and set up camp in Italiano, or continue on to Frances or Cuernos to shorten your next day. Pro tip: If you’re hiking up to Chileno on Day 4 (which we recommend here), you should probably choose Frances or Cuernos for night #3. This will shorten the hike the next day, which is pretty long and grueling. Overnight at Italiano, Frances, or Cuernos. You choose! I’m not going to lie — this day can be BRUTAL. But the reward of staying in a campsite that enables you to see the Torres at sunrise is, in my opinion, 100% worth the pain. The hike is long (over 20 kilometers) but mostly flat, although the last stretch is a steep uphill for ~3-4 kilometers. You’ll start the day at whatever campsite you chose to reserve the night before, and you’ll start walking. The trail on this day is beautiful, passing by Los Cuernos mountains and the pristine, blue Lago Nordenskjold. Eventually, you’ll reach a fork in the road with a battered sign that says “shortcut to Chileno.” TAKE THE SHORTCUT. If not, you’ll take a detour of several extra uphill miles, which you DEFINITELY do not want to do. When I last took the shortcut, it involved crossing a hip-deep river (**although that may have changed since 2016…if you do it and cross said river, please let me know!). Then, you’ll slush around in damp shoes for another 6-7 kilometers, the last 3-4 which are steep, uphill, and full of day trekkers coming the opposite way from the Torres. Eventually, you’ll cross over a hill and see a large bridge crossing the valley river. Right across that bridge is Chileno camping & refugio. You’ll check in for both at the main cabin. And yes, the hot showers here are the best you’ll take during the entire trek, so enjoy it. Wake up at 3:30 AM (yep, you heard that right…) and check the weather. If it’s raining, go back to bed – it’s not worth going up to the mirador if it’s pouring or storming out. However, if it’s clear or partly cloudy out, leave your tent pitched in your spot. Grab your head lamp and a few warm layers and head up the trail toward the Torres del Paine mirador. In the beginning, the trail is a gradual uphill, but in the last 2 kilometers or so, the uphill is super rocky and steep. Side note: I definitely had to physically climb some of the rocks on the last part of the trail. No shame! I’d recommend hanging out here until 7:00 or 7:30 AM, then head back to Chileno to pack up your stuff and head down to Torre Central. From there, you’ll catch the shuttle to Laguna Amarga (the entrance), and then you’ll catch your bus back to Puerto Natales. The 4-day version of the W Trek in Torres del Paine is perfect for time-strapped travelers who want to see it all. You won’t miss any attractions on this itinerary, although you’ll be doing a bit more hiking on the first day, since you’ll head to Grey and back in one day. The rest of the itinerary is the same as days 3-5 of the 5-day version (so we won’t repeat it here). As in the 5-day itinerary, you can reverse this route as well, starting with Torres Central/Chileno and ending at Paine Grande. Unlike the 5-day itinerary, you’ll want to head up towards Grey as soon as you arrive at Paine Grande, especially if you want to walk the full way to Grey and back (8-9 hours round trip). Another option for this day is to hike up to the Glaciar Grey mirador (the halfway point to Grey campsite) and then turn around (4-5 hours round trip). Either way, the trail is an out-and-back path, so when you’re ready to return to Paine Grande, you’ll just turn around and go back the way you came. Day 4 – Chileno to Mirador Torres to Torres Central to Puerto Natales: Rise and shine early in the morning (like 3:30 AM early) and hike up to the Mirador Base Torres for sunrise. Then, head down, grab your bags at Chileno, and hike down to Torre Central to catch your bus back to Puerto Natales. Can you spot a furry resident of the W trek in this picture? If you’re very strapped for time, you can still experience most of what the W has to offer. However, you’ll be hiking longer distances each day and stopping for less time at the landmarks. In this itinerary, you’ll cut out Grey Glacier and instead head directly to Mirador Britanico and Mirador Torres. If you want to modify this route, I would still strongly recommend starting at Torre Central and Chileno. It’s a lot easier to hike Mirador Britanico in the morning, and the only way you can do this is in the clockwise direction. You’ll start this day by arriving at the Puerto Natales bus station at 6:40 AM. Take the 7:00 AM bus from Puerto Natales to the Torres del Paine entrance, grab your stuff off the bus, pay for your ticket, then catch a shuttle to Torre Central. From Torre Central, you’ll hike up ~4 hours to the Mirador Torres (if the weather is nice). On the way to Mirador Torres, drop your bags off at Chileno, as you’ll be back later to camp here or stay in the refugio. After Chileno, it should take ~2 more hours to get up to the mirador. The terrain here is fairly flat until the last 2 kilometers, where the trail becomes steep and VERY rocky. Hang in there, you’re almost to the top! Once you get to the mirador, you’ll be treated with beautiful views of the Torres del Paine peaks as well as the alpine lake below. Hang out here for a while, then head back to Chileno, where you’ll spend the first night. Cross the bridge towards Torre Central, then hike 3-4 kilometers until you see a right turn towards Los Cuernos (ask a range or guide nearby if you have trouble finding it). Turn right at the fork and head towards Los Cuernos. Hike over mostly flat terrain past Lago Nordenskjold and Los Cuernos. Eventually, you’ll arrive at Los Cuernos. Keep going on the trail for Frances and Italiano. Wake up early (~6:00 AM) and, if the weather is fairly clear, hike up to Mirador Britanico in the morning. If necessary, bring your bags and drop them off at Italiano on the way up. Head back to Italiano, grab your bags, and head to Paine Grande. Wish we’d had this article when we were planning our W-trek in 2015. Loads of good details and tips! Thanks Guy! It’s truly a spectacular adventure, isn’t it?